How to Maintain Hardwood Conservatories? Hardwood conservatories are built to give a traditional look to the house. Different varieties of wood including oak, idigbo, mahogany, meranti, sapele, iroco and utile are used. 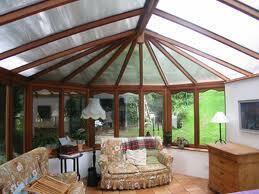 It is necessary to properly maintain these wooden conservatories for longer durability. A structure with powder coated aluminum capping is fixed on the roof of wooden conservatories. All the roof beams and glass are covered by this structure. It is added to enhance the durability. It is necessary to apply micro-porous paints and stains to the wooden components once in every five years. Conservatories made of high resin hardwoods like oak should be painted frequently. You must clean and oil the door and locking systems of wooden conservatories for every six months. When you use glass in the wooden conservatories, it is better to choose a self clean glass that avoids any marks or dust. You should avoid standing water at the conservatories. This is because, water rots the timber. So the structure of the conservatory may be ruined. When you take care that proper maintenance is provided regularly for hardwood conservatories, they can last longer.